Cabinet has expressed concerns over the developments regarding the new regulations of the International Association of Athletics Federations (IAAF). Last month, the global athletics governing body, the IAAF, announced new rules, with a separate female classification for athletes with differences of sexual development (or DSD). 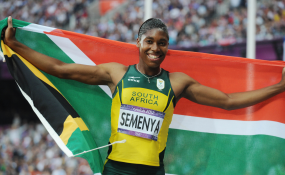 Such athletes, including South African athletic star Caster Semenya, will have to reduce and then maintain their testosterone levels to no greater than 5nmol/L by November 1, 2018, if they want to compete in events ranging from 400m to a mile. Semenya has dominated the women's 800m over the last few years, with some of the athletes continually left in her dust, complaining that they are at a disadvantage. Communications Minister Nomvula Mokonyane on Thursday presented a briefing on Wednesday's Cabinet meeting to the media. "Cabinet welcomes the work being done by the Department of Sport and Recreation South Africa and, the fact that a high-level panel of experts in the related fields of medicine and law assembled by SRSA. "This panel will study these regulations closely and interrogate the scientific evidence that the IAAF had relied upon. It will evaluate all available research and scientific evidence, as well as related ethical issues, and use the outcome to challenge these regulations in the appropriate forums," reads the statement. "We want to assume these regulations have nothing to do with the capabilities of Caster Semenya," added Mokonyane. She said Cabinet was calling on South Africans to support all athletes who may be affected by these regulations, both here at home and in the rest of the world.